The proportions in which we should eat them. Of course it’s a little more complicated than that because the Pyramid shows foods in core groups, but most of us don’t eat that way – we combine our core food groups in ways that can make it tricky for us to assess the proportions of each food in our daily diet. For example, how much of the grain group is contained in a margarita pizza, and how much dairy and how much vegetable? This quiz helps you tease out how the pyramid works when we combine foods so you get a better understanding of how your daily diet can be measured against the Pyramid guidelines. It doesn’t help that the Americans measure everything in cups, as well as ounces! An American cup is about the size of a British teacup but there are specialist measures, like a vase, that can help you assess exactly how much of each food you are eating. A - How much grain should the average adult eat? 3. A minimum of three ounces and a suggested best of six ounces for women and seven ounces for men. B - What counts as an ounce of grains, proportionally? 3. An ounce is roughly: two slices of bread, a bowlful of packet cereal and a cup of cooked rice or pasta. C – We are supposed to eat three cups of dairy foods a day, and that’s easy if we’re measuring milk or yoghurt but what counts as a cup for solid dairy products? 3. Four ounces of cottage cheese or three ounces of processed or hard cheese count as a cup. 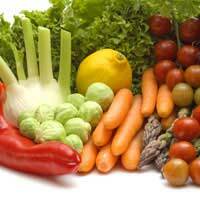 D – Vegetables should make up a good proportion of our daily food intake. For men the recommendation is three cups, for women it’s two – how do we assess the proportion of vegetables in our diet? 3. Half a large pepper, three slices of a large tomato and a cup of shredded lettuce would each count as a single cup - together they make up three cups of vegetables. E – Water is a vital contribution to health. We can consume it as a drink or as part of our fruit and vegetable allocation. How much water should the average person drink a day? 3. Four to six glasses. 3 is the right answer: we should all consume a minimum of three ounces and a suggested best of six ounces for women and seven ounces for men. If you answered either of the others you wouldn’t be entirely wrong though – five ounces would be a good enough for most people and the current recommendations are that we should ensure at least half our grain intake is whole-grain. 2 is the correct proportion. 1 is the right answer. Hard cheese is higher in fat and salt, which is why it is proportionally smaller than cottage cheese which is high in water. 2 is the right answer: although it seems odd, it takes two cups of leafy green vegetables to count as a single cup in proportion terms. The correction proportion is 1. We should have an intake of six to eight glasses of water a day, whether we drink it or consume it as watery vegetables and fruit.